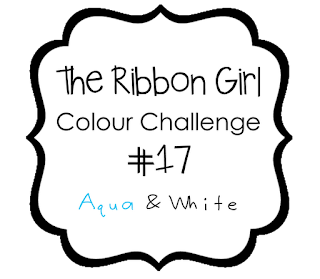 Another card for Ribbon Girl's aqua and white challenge! I found this fun flower ribbon at the local fabric store and was excited to get a chance to use it! I stamped the grid pattern in Jenni Bowlin's speckled egg ink and then layered an impressed Hawaiian Shores piece of cardstock over. I inked the By the Numbers impression plate with Versamark embossing ink and then heat embossed with clear embossing powder. The die cut was popped up with foam dots and then used some scor tape to adhere the ribbon.